With higher installed capacity than solar, wind energy may hold the key to unlocking India’s renewable energy potential. The wind industry, which had been spearheading India’s renewable energy push since the end of 1990s, is now fearing just that. Ever since the government unveiled its ambitious plans to generate 100 GW of solar electricity by the year 2022, solar energy has been the showpiece of India’s renewable energy policy and its climate change action plan. Wind energy has been reduced to playing second fiddle, despite the fact that it was an early mover in the renewable energy sector and even today has an installed capacity of about four times more than solar energy. Thanks to sustained policy push, incentives, and attention from the highest echelons of decision making, solar energy has started to take off in a big way. In the last one year, more than 3 GW of solar capacity was added in the country, taking the total installed capacity to almost 8 GW. It is still a tall order to attain the target of 100 GW in the next six years, but at least the sector cannot blame negligence. The wind industry, which had been spearheading India’s renewable energy push since the end of 1990s, is now fearing just that. While the sector would not mind the attention that solar has been getting in the last few years, but has been seeking some policy consideration for itself as well. “The importance being given to solar is not unexpected. Wind is placed in a much better situation and is already fairly well established, while solar is still in its infancy. But solar cannot be the only solution to India’s energy problems. The answer has to come from both solar and wind. Hybrid (combined solar and wind generation) policy is also going to play a major role,” Sarvesh Kumar, chairman of the Indian Wind Turbine Manufacturers Association (IWTMA), said. At nearly 27 GW of installed capacity, India is already the world’s fourth biggest producer of wind-based electricity, after China, the United States and Germany. Latest outlook from Global Wind Energy Council shows that India would have close to 45 GW of installed wind energy by the year 2020 even in the most modest of growth scenarios. If pushed aggressively, it can go up to 67 GW by 2020. That means, India’s target of generating about 60 GW of electricity through wind energy can be realised two years in advance. Last year, the National Institute of Wind Energy (NIWE) in Chennai revised the estimate of wind power potential in the country. It was earlier estimated to be just over 102 GW, if tapped at a height of 80 metres from the ground. Thanks to availability of better technology, the NIWE said it is now possible for Indian companies to install taller wind mills that go up till a height of 100 metres. In that case, the potential for wind energy in India shoots up almost three times, reaching 302 GW. What’s remarkable is that more than half of this potential, 153 GW, is located on wastelands, according to NIWE estimates. Viewed from this context, India has currently utilised just about eight per cent of its wind energy potential. It can easily grow at a fast rate, possibly even outpacing the growth in the solar energy sector. 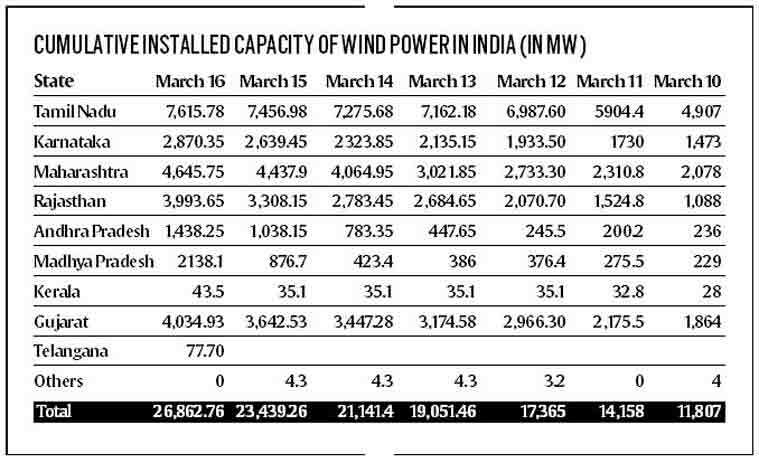 India’s wind capacity has grown from nearly 12 GW in 2009-10 to more than 27 GW now. Almost 10 GW of this capacity addition has come in the last four years during which most of the policy focus was on solar energy. To accelerate growth in the sector, the government, in January 2015, announced a separate Wind Mission under the National Action Plan on Climate Change (NAPCC). The Solar Mission has been in place since 2008, as one of the original eight missions in the NAPCC. There are also plans to increase the wind energy generation target to 100 GW by 2022 from the current 60 GW. Earlier this year, the government also announced incentives for the industry to ‘repower’ their existing wind turbines. Most of the wind mills in the country are of low capacities and are harnessing energy that is far less than the potential. As part of the incentive, the companies would get assistance from the government to replace the existing turbines with those of higher capacities. The wind industry, however, is asking for more. “There is no doubt over the intention of the government to promote the wind sector. But the clarity and focus seem to be missing. There is no consistency in the policies. Recently, the government decided to withdraw 50 per cent of accelerated depreciation benefit to the industry from next year. The generation-based incentives are also being withdrawn. These steps are not particularly helpful for the growth of the industry,” IWTMA’s Kumar said. He said the wind manufacturing industry had the capacity to produce equipments for 10 GW of generation, but domestic demand was only about 3 GW. “In the absence of proper atmosphere for export, our potential is getting wasted. The government needs to create the platform to enable the industry to export. Outside, our companies have to compete with their Chinese rivals who get lots of incentives from their government,” Kumar explained. The industry is also keenly awaiting the Renewable Energy law that has been in the making for quite some time now. “The industry is looking forward to a new renewable law that would bring in policy clarity and remove uncertainties in the sector. Investors need long-term predictability to invest big money. Currently, that is missing in the wind energy sector. The Ministry of New and Renewable Energy issues guidelines from time to time, but many times these are not adhered to. States have their own separate policies. The wind energy sector is waiting for the right kind of attention from the government in order to achieve its true potential,” Manish Kumar Singh, secretary of the Indian Wind Energy Association, said.